Price hikes, load-shedding, strikes and late delivery. It just does not feel like they have things under control. 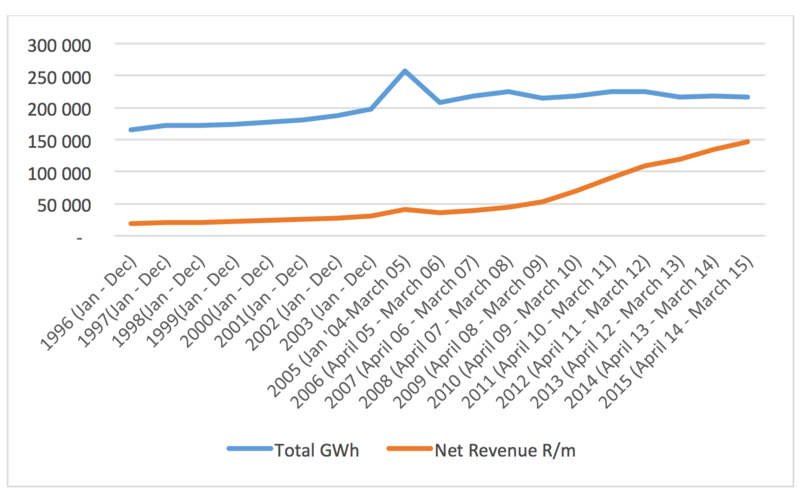 If you don’t agree then these two charts from ESKOM may change your mind. These price increases are big! And this year’s application is in line with this trend at 17% – well above the consumer price index. Why do they need such a large increase? Well, Eskom has been running large diesel generators to try to offset peak consumption load-shedding, and diesel costs a lot more than coal. In essence, we have been paying for a very expensive solution to mitigate load-shedding, while still getting load-shed. But this should all be ok, shouldn’t more money for Eskom mean more infrastructure and therefore more generating capacity? Well no, the above chart shows that more money does not translate into more capacity. I am not about to start trying to explain this or talk the politics of who is to blame. It’s just not good for anyone’s blood pressure. What I am going to talk about is what you can do about it. It’s important to highlight two aspects of this dilemma that Eskom has created for us. Energy Cost – what you pay for the energy that you use. You can get Energy security by storing Energy, generating Energy, or by both storing and generating Energy in combination. Here you are investing in technology to avoid revenue loss or being left at home without a hot shower and warm dinner. These systems can be quite costly, but if you’re able to purchase or finance them you can typically achieve a return on capital within three to seven years (depending on which municipal tariff you are on and the level of income risk). At Terra Firma Solutions, we help large industrial and commercial customers select and size these types of systems. With these systems you are given more control of your energy cost and capacity. When it comes to Energy Cost reduction, there are even more options. Here you are not keeping the lights off, but rather making them cheaper to keep on. Here you can get back some of the money that Eskom is trying to extract from you. Wastage – lights on during the day, geysers and air conditioners running when no one is in the office… You will be surprised how much you can save with some small changes, many of which cost nothing! Demand management – some municipalities and Eskom tariffs charge for your peak energy usage. If you can shift your peak load by altering your production schedule there can be some significant savings. Time of use (TOU) – Similar to phone calls, some municipalities bill your energy usage at different rates throughout the day, with peak rates sometimes costing as much as four times the off-peak rates! Moving big energy loads to these periods will drop your bill considerably. Hardware solutions – old electrical motors, lights and transformers are not as efficient as the current generation of hardware. Being able to assess the inefficiency of this equipment and translate this into Rands makes it very easy to decide if investing will save you money. Often you can do this within your building’s repair and maintenance budget and can limit the cost significantly. We typically see payoffs within one and two years. Again, Terra Firma Solutions can help you do this. Human Behavior – one of the best ways to reduce energy use is to show people where they use energy and what it costs. This view of the cost of electricity in real-time makes it easy for people to understand how their behaviour affects energy usage and cost. With this method we have seen energy bills drop between 10 and 15%! It also shows commitment to going “Green” and often helps market your company. Generate power – if you leave out energy storage, solar power can be very cheap. And it’s only getting cheaper! Grid-tied solar systems allow you to produce some of your own Because these systems last about 20 years, you effectively “lock” the cost of your generating capacity. It’s a bit like buying a house vs. renting one – where your bond stays fixed, but rent will always go up each year. The list above is all fine and well but how do you know which one is right for you? After all, you have a limited budget and need to get bang for your buck! The bad news is that is not a start at the top and work your way down problem – you need data. At Terra Firma Solutions, our professional Electrical Engineers start the process by getting a load profile. Which is the process of measuring your energy consumption every 5 min (along with voltage, current, power factor, etc.). They do this with a portable data logger or COPPER – our smart metering solution. Once we have a week’s worth of data and 12 months’ worth of energy bills, we are in a good position to start our work. Depending on which tariff you are on our Engineers will recommend a set of projects with costs and payback periods that will have the best payback. COPPER is a great way to “see” where your energy is costing you. COPPER also does a lot more, like generating bills for tenants or analysing energy usage to identify where you can save. It also includes a monthly energy assessment by our Energy efficiency engineer at no added cost. It is the go-to solution for reducing energy costs without breaking the bank. Eskom is not reliable, and we can expect them to keep charging us more and more. You need understand the revenue loss due to load-shedding and understand if you should have energy security hardware. You need to understand where you’re losing money on energy. Empower yourself, and get help from a company who you can trust to help cap your energy costs and protect your revenue. http://terrafirma-software.com/wp-content/uploads/Medupi-pic-1.jpg 1284 3456 Douw Jordaan http://terrafirma-software.com/wp-content/uploads/tfs-logo.svg Douw Jordaan2015-11-23 12:48:482015-11-23 12:48:48Eskom – Feeling Disempowered?